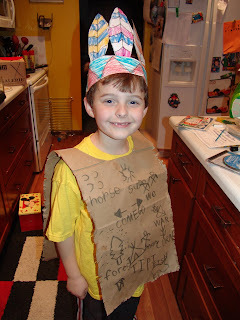 Here are the hat, vest and place mat Ryan made for the Thanksgiving Feast they had at school. Isn't he a cute little Indian. Oh he is such a ham! ha ha Too cute! He did a great job on that! I love all the little symbols on his vest. Very cute! Cutest Indian I had ever seen! I love the pictures of your dog in the box! So funny!!! Your son is adorable and your dogs are a riot!!! I love his placemat. Did he use that on Thanksgiving? It looked laminated, smart idea to do that. 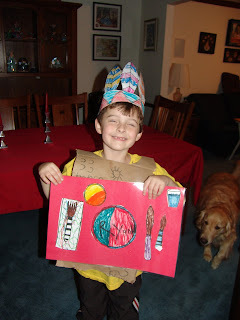 Yeah he used it on Thanksgiving, it is laminated! That is an awesome outfit! I love it!